The orange day lily is Witless Bay’s Official Flower! The Town of Witless Bay now has an Official Flower! Flowers are an important addition to any exterior beautification project. They symbolize life, and add interesting splashes of colour. They’re quite inexpensive and make an enormous difference in terms of aesthetics. When visitors make their way to different places, they pay special attention to what makes these places special. The persistent presence of the orange day lily throughout our town will help mark Witless Bay as a special place worth exploring. 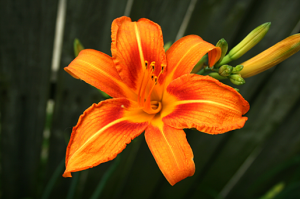 The orange day lily has long been growing in gardens and planters in our community. Known as “the perfect perennial” because of its hardiness & low-maintenance, the variety that grows in Witless Bay is a brilliant orange with some yellow, which makes it a perfect complement to our Town’s colour palette (which is taken from the puffin)! Show your community pride and plant some day lilies in your planters and gardens! A generous resident has stepped up and offered to supply residents with the first 500 cuttings! Please contact the Town Office to reserve – we will even deliver! St. Bernard’s Elementary School will be planting some day lilies in its community garden this year so that the kids can help create the stock to be shared with the community in the future! If you also have a daylily plant that’s ready to be divided and shared with others, please get in touch with Council and we’ll happily assist you! In Winter 2014, the Community Enhancement Committee began discussing ways to highlight Witless Bay’s natural beauty. One of the many suggestions included encouraging residents to plant more flowers throughout the community. A discussion on the choice of flowers then followed, which led to the idea of selecting an “official flower” for the municipality, which, planted throughout the community, would really help make Witless Bay stand out. o The flower should already grow in the natural environment of Witless Bay. o Perennials were preferred over annuals, since they’re easier to grow from year to year. o The flower selected should have a symbolic meaning for the Town. After having considered a number of great candidates, the Community Enhancement Committee selected the Day Lily as the candidate of choice, made its recommendation for official ratification at the May 2014 public meeting of Council. The motion passed unanimously.